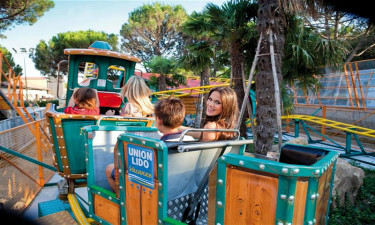 Located close to the inviting waters of the Adriatic Sea, Union Lido is a holiday camping site ideal for families who wish to enjoy unsurpassed levels of luxury camping. Please contact LUX-camp for further details. If you arrive at Union Lido before 10am, it is not allowed to park in the campsite's waiting zone. After 10am you can be checked in at the reception and then you can check in with the courier of your accommodation. Your accommodation will be guaranteed from the time mentioned on your voucher. In order to save waiting time on arrival at the campsite, it is recommended to enter the site website and check in online before arrival. Go to www.unionlido.com - upper right corner select language - go to the bottom of the page and select Fill & Go - complete the form. Please note it is not allowed to park in Via Bologna or Via Milano. Before departure, we recommend that you settle for tourist tax at the main reception before checking out with your campsite courrier, as you may be having trouble getting your deposit back otherwise. One of the aspects making Union Lido such an impressive holiday camping site is the availability of cutting-edge conveniences. These include wireless Internet connections, power supplies to each pitch, waste disposal facilities for mobile homes, baby changing rooms and even showers designed specifically for dogs. This final benefit is excellent for families that choose to bring their pets. Why Should I Choose Union Lido for a Luxury Camping Site? No less than 2,931 pitches to choose from. Spacious and comfortable mobile homes. Exclusive wellness club as well as facilities for kids and grown-ups alike. A impressive array of on-site activities. A camping holiday here is made even more special thanks to child-friendly activities. There is a separate play area for young ones; perfect when parents require a bit of rest and relaxation. 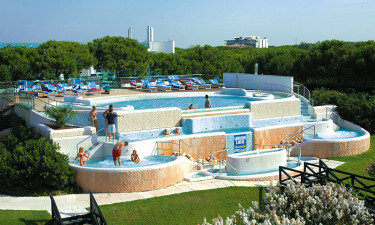 Children's entertainment is also provided by the staff of this luxury camping site. Indoor facilities are added benefits should the weather outside be chilly or otherwise inclement, with activities including a water slide and a sandy beach within the confines of the resort, offering hours of unbridled fun. As this holiday camping site is an impressive 60 hectares in size, it only makes sense that the activities offered are just as unforgettable and diverse. An open-air pool is a great option when families wish to stay closer to their mobile homes. Miniature golf, volleyball and table tennis are ideal distractions for the entire family and for those who prefer their holidays in the pool, aquatic choices include sailing, surfing and even a private boat hire service. Happy visitors will enjoy renting a bicycle to take an excursion into the nearby countryside. Any luxury camping experience would be incomplete without luxury dining experiences, too. There are a number of restaurants to enjoy during any camping holiday here. Those who desire to experience unparalleled views of the nearby sea can visit Ristaurante al Mare while Ristaurante alla Fattoria offers a wide variety of gourmet dishes for anyone who hopes to appreciate the true splendour of Italian cuisine. Ristaurante Cavallo Marino is located within the on-site water park and likewise provides an unforgettable dining atmosphere. Bars such as Blu Bar and Beach Bar are open throughout the day for a tempting cocktail or to wash a dinner down with a well-prepared aperitif. A large camping market will provide families with basic provisions such as fruits, vegetables and sanitary items. A bakery known as La Bottega del Pane offers fresh bread and pastries on a daily basis, and for those added extras, the kiosk Lido Tabacchi provides tobacco products, international newspapers and souvenirs. 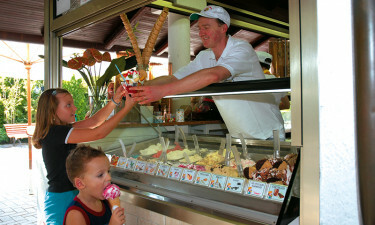 A separate open-air tourist market is perfect for other items as well as a selection of snacks. To learn more about the numerous other opportunities which await at Union Lido, please contact LUX-camp at the earliest possible convenience.